Stop putting toxic chemicals on your body & your pets! Rid yourself of those pesky insect., Be healthier and smell great too! Tested for years on an avid hiker and back woods camper, 'me.' Yes, I also experimented on my family & friends; who else can you take advantage of. With a lot of grumbling at first about taking "the chemicals" just in case, all were thrilled at my natural repellents effectiveness. We have many happy repeat customers looking for "Happy Hiker" every year. Excellent for hikers and campers or those just wanting to stay out on those warm summer evenings without being eaten alive. Contains- Distilled water, witch hazel, pure essential oils including,Lemon Eucalyptus, Lemongrass, Lavender, Peppermint. All known to be plants that repel insects. Shake Well before using, safe for all ages, spray over skin & clothing. Received my Happy Hiker today! Thank you so much! Love, love, love this product and your service has been excellent. All Natural insect repellentTo take advantage of this amazing website offer Happy Hiker must be ordered in increments of 2/4/6 etc. 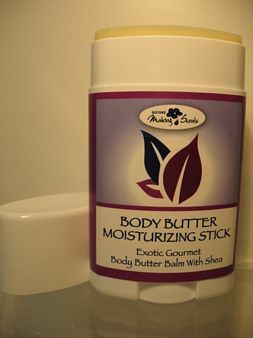 A delightful rich exotic massage butter for your body. Our twist up stix won't leave you wondering what to do with all the butter all over your hands or wondering how to re wrap that butter in that little piece of tin foil! Use this butter as an after sun skin conditioner, for a great massage, on your lips, hands, elbows and feet, or anywhere you please. Some girls love it as a perfume stix. Your skin will love you for the rich deep conditioners in this butter and your nose will be ever grateful for the uplifting scent. Our Stix is a 50 gram twist up ! Please note only available during temperatures 20 C or lower. Out bath salts were developed with soaker tubs in mind. 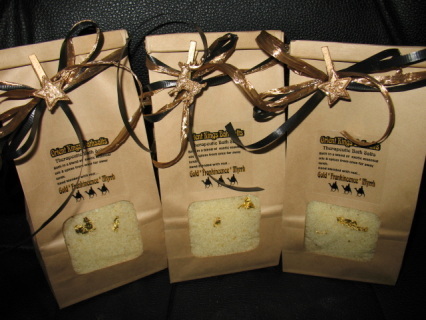 Try a cup of our bath salts and soap for 20 min and you will feel wonderful and relaxed! We sell our salts by the pound, that's right... a whole pound in our bags. 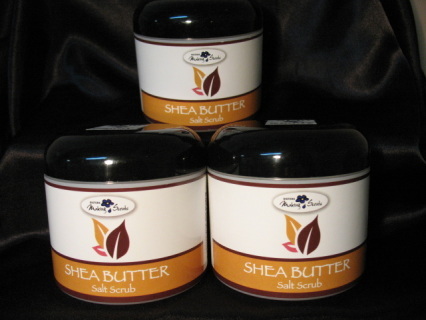 It's an invigorating & cleansing treatment that leaves your whole body polished to a soft, smooth & radiant finish! Our Salt Scrub - Body Polish will leave your skin feeling like you just stepped out of an expensive spa! Whipped to perfection using only the finest natural ingredients, Shea butter, Sea Salt, Sweet Almond oil, Essential oils or hand picked fragrances and Rosemary leaf extract as an antioxiident. It's simple to use, can be used over your whole body or zero in on rough spots like elbows and feet or use on your hands. To use all over your body just step into your tub dry and apply scrub in a circular motion allowing salt to exfoliate, rinse and pat dry. You will feel like a baby again! haunting because it smells different every time you smell it. French Lavender, Rose, Gerainum, Patchouli & Sweet Orange...Yum. My personal favorite feel good arromatherapy blend. I use it in my defuser all the time. This is a luscious essential oil synergy of sweet orange, patchouli Ylang Ylang essential oils. May Induce euphoria with this delicate and sweet floral aroma.